The RAU Stand Easy cattle safety immobiliser is an innovative device that immobilises cattle to allow the handler to brand, castrate, band, dehorn, treat minor wounds, mother calves or trim hooves in safe, humane conditions. Proving indispensable for cattlemen throughout Australia, the cattle safety immobiliser is suitable for a wide range of applications on the farm such as the treatment of stock entangled in wire. Once the device is attached, the animal will stay still, enabling the safe removal of wire and treatment of the wound without risk of injury to the animal or handler. Compact and portable, the RAU Stand Easy cattle safety immobilisers can be used in a paddock situation if necessary. The pulse emitted by the immobiliser, when applied to cattle is designed to immobilise the voluntary muscle movement and prevent the animal from kicking or make other movements. The dial on the device can be adjusted for the immobiliser to be used on cattle of any size from calves to bulls or bullocks. Completely safe, the immobilisation does not cause any stress to the cattle and field trials have shown no negative effects, even on pregnant cows at any stage of pregnancy. Kevin Woolcock from Springsure, Queensland, and a user of the RAU Stand Easy cattle safety immobiliser expresses his extreme satisfaction with the device. 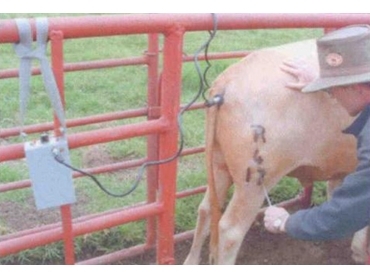 Having used the immobiliser for a wide range of applications including mouthing bulls, to NLIS grown cattle as well as assisting in veterinary procedures, he confirms the efficacy of the device in allowing various procedures to be carried out with minimal stress to both the animal and handler.